Retinal vein occlusion, sometimes called an “eye stroke”, is one of the most common causes of vision reduction in older people. Mostly affecting those aged 60 and older, it is sudden and often painless. Here, we go over the ins-and-outs of retinal vein occlusion, including what it is, the symptoms, the causes, and the treatment options available. A retinal vein occlusion happens when a blockage (or occlusion) forms in the retinal vein. Your retina is the membrane which lines the surface of the back of your eyes and retinal veins are responsible for draining blood from this area. If a blockage happens in one of these veins, then blood or other fluids can leak into the retina. The symptoms are varied and may not always be as severe in one person as they are in others, this is down to individual physiology and also whether the blockage is in the central vein or in one of the branch veins. Vision loss or blurred vision in part of, or all of, one eye is the most common symptom of retinal vein occlusion. This can happen very suddenly, or, from the onset, can get gradually worse over the course of a few hours or a few days. Some people experience a sudden loss of all vision. ‘Floaters’ – dark lines, smudges, or spots, may be noticeable in the sufferer’s vision. These floaters are shadows from the tiny lumps of blood which leak into the vitreous from the retinal vessels. Pain, and possibly a feeling of pressure, is only present in the most severe cases. Occlusions are the result of a blockage in the veins. This is usually because of a blood clot restricting the blood flow. Exact causes are unknown, but there are a few conditions which make the chance of developing a retinal vein occlusion more likely. Vitrectomy – a type of eye surgery which addresses issues in the vitreous or the retina. A branch occlusion may not require treatment and the condition may resolve itself with time, a central retinal vein occlusion, on the other hand, requires immediate treatment. If you think you might be experiencing any of the symptoms of a retinal vein occlusion please see an eye doctor immediately. The two types of retinal vein occlusion are branch and central. Although similar, one is generally more serious than the other. Central means that the main retinal vein is blocked. In general, the loss of vision experienced is more severe if it is the main central vein which is affected. Branch retinal vein occlusion happens when one of the four retinal veins (branching off the central vein) is blocked. These branch veins are each responsible for draining around a quarter of the retina. 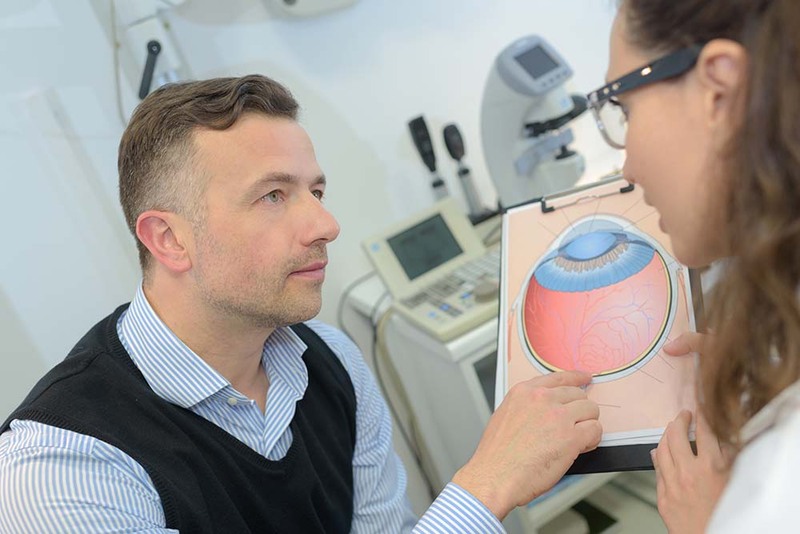 If you suspect that you might have a retinal vein occlusion, please make an immediate visit to us at the New Jersey Eye Center where our experienced and knowledgeable staff will help you by diagnosing and treating the condition.